The Soligen show is upon us and I thought to share this piece I did for it with you. The Katzbalger is something I have wanted to made for some time and now I had the perfect opportunity to have some fun with the design. There are elements from several originals put into this, with a little tweak added here and there. 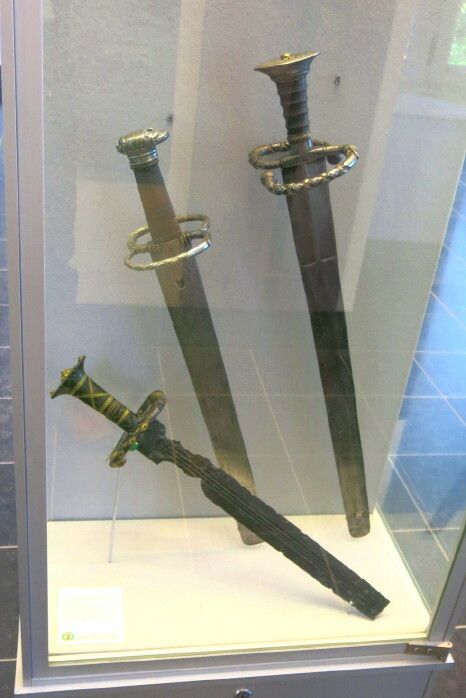 The sword is of the same size as an original from Dresden museum, but is slightly lighter and has a broader blade. In hand the Katzbalger has quite nimble presence - the tip moves fast with very little effort. The essential measurements are: oa. length 79cm, blade length 66,5cm, blade width 5cm, weight 1,275kg, pob. 9,5cm from the guard. The blade is hammered out of 0,75% carbon steel, guard & pommel are forged and filed (and filed and filed) from iron and the "grip" is of stag antler. I meant to make a scabbard with by-knife and pricker included, but unfortunately run out of time. So I'll be making the scabbard after the show - unless, of course the sword is sold before I get around to it. Without further ado, here's few pictures I managed to take of the show before I showed it into my cello-case. Please enjoy! It's a gorgeous piece. I'm curious, what will you be listing it for at the show if I can ask? This piece fits exactly where my current interests are... wow. Thank you for your comments gentlemen! But of the sword: They aren't wires between the hilt parts, but brass spacers that have been fileworked to look like twisted wire. Let's see if I can add few pictures of the actual show to the tread when it begins. it looks like a jewel! I think its bluing is spectacular! its not overly blue - but retains a bit of a steely look. I just want to hold it - but then I wouldn't be able to resist swinging it! Very cool work. Looking forward to seeing a scabbard and suchlike for this fine piece. 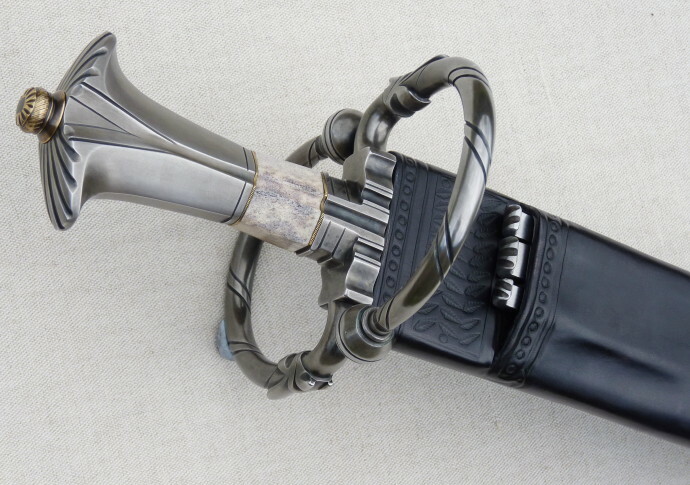 Yes it's very nice and I would like to see what a scabbard matching it would look like, very fine work I'm sure. 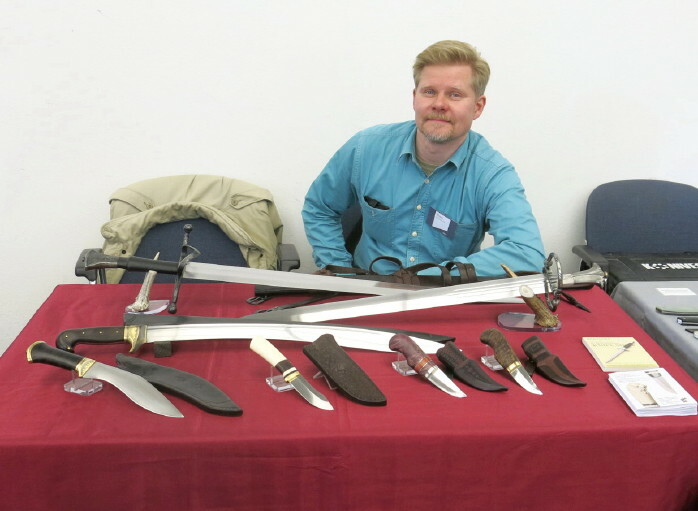 Still, oddly enough, Peter and I were the only ones with longer blades on our tables, apart from a stray wakizashi or such in among the tables. 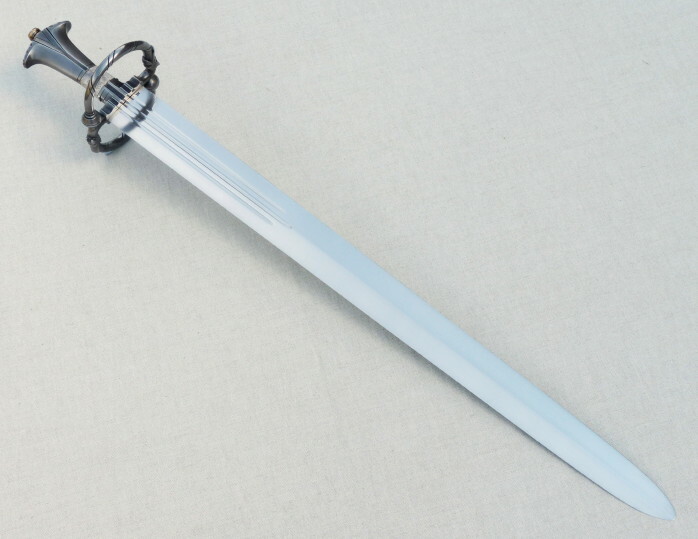 But, I found out that in order to sell a Katzbalger there, it should be a short-bladed one and definitely blunt, to be used in re-enactment battles. And only thing I can say about me starting to make blunts is: "Errrrr..."
Next, I'll start to forge the by-knives & pricker for the scabbard, have to decide what kind of knives I want to go with the scabbard. I didn not manage to take pictures of the show, but here's two anyway: The three katzbalgers of the museum and yours truly at his post..
...btw. noticed from the previous reply how the proof reading program of my computer had turned "filework" into "firework" - funny! I did not sell the sword in Solingen (surprise...) so I am working with the scabbard for it. Unfortunately I have several projects that sort of overlap each other, so the going is kinda slow. 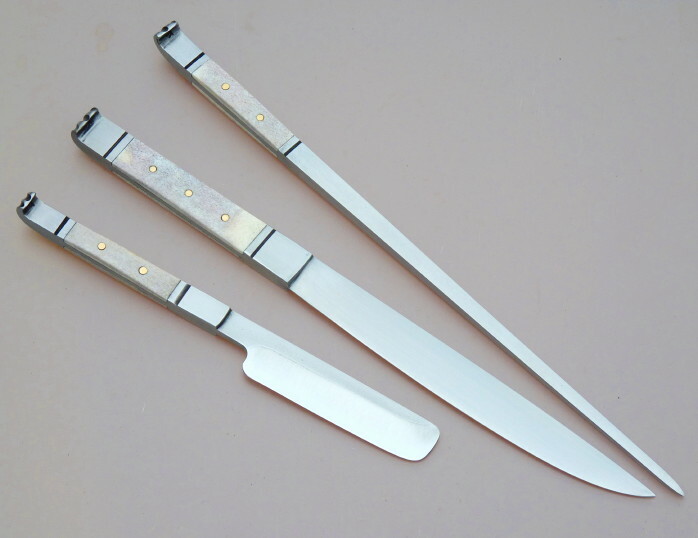 But, I have finished the by-knives for the scabbard and I thought to share a picture of them here. 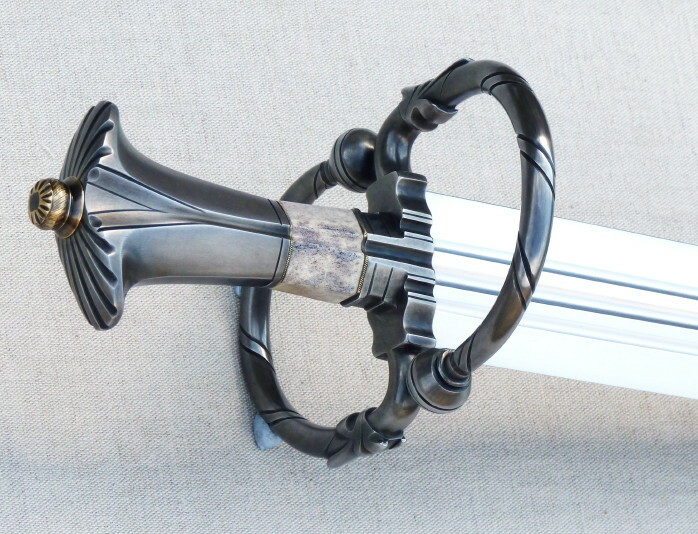 I sought out similar kind of grey-hued antler to match the one in the sword hilt and tried to keep the lines very simple and clean, with only little filework in the pommel "hats". 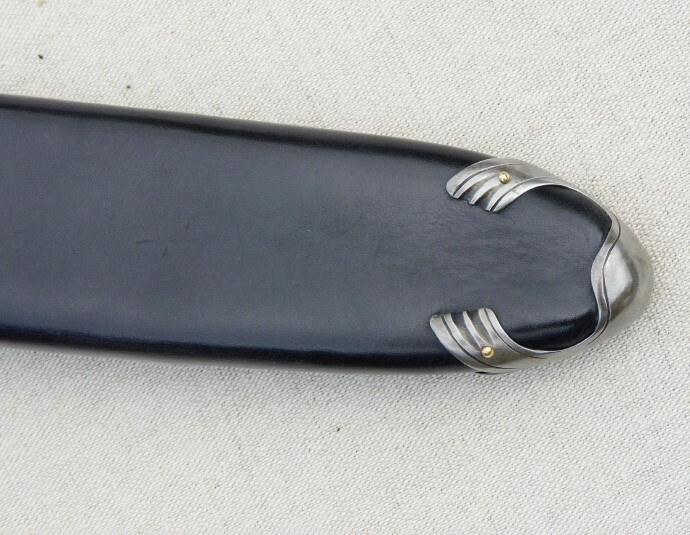 The scabbard is made of double-thickness heavy leather. 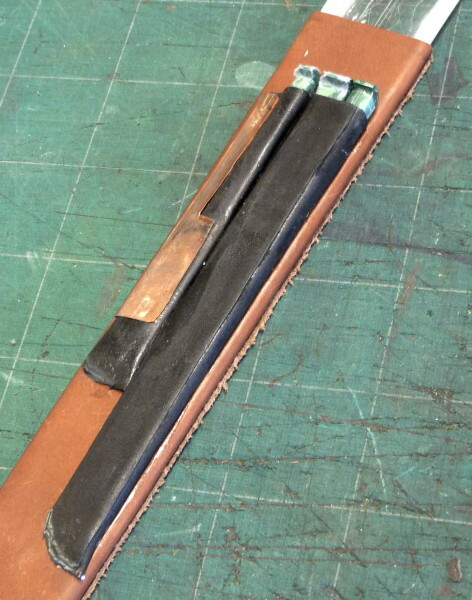 The by-knives have separate thin leather sheaths that have been glued on top of the core leather. The chape is a rather untypical in shape, but I do not like those broad ones that are much wider than the rest of the scabbard and are likely to get stuck into things. Besides, I feel that making chapes is not really my forté, so this is something I managed to do and matches the style of the swords' hilt. The whole package weights bit over 1,8 kg, so carrying this at one's side is pretty much the same as carrying a longsword - except that this does not get tangled in peoples feet or clothing so easily - maybe. Of the by-knives: the knife is really a sturdy piece of work, with oa. 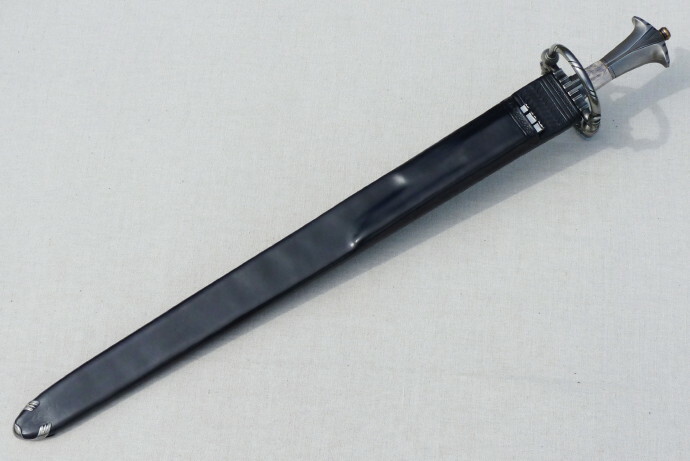 length 22,5 cm and 3mm thick back (pob is just at the joint of the hilt and blade). The spike is also quite long, 23,5 cm, so that picking food from a kettle should be easy. The razor I have used twice to check that it truly works properly. 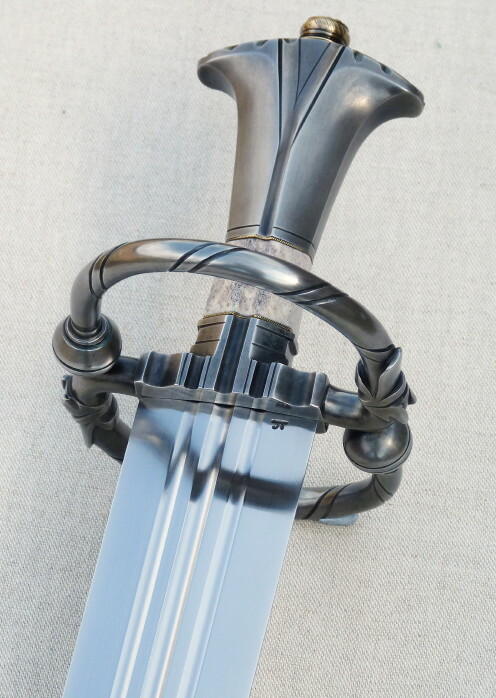 In all, this sword was a time consuming and laborious project - but surprisingly quite fun to make! Now I just hope that I would find a buyer for it. Any takers here? It's a wonderful weapon.... Iovely details and finish. It is absolutely amazing! Have you determined a final price for the set? That is gorgeous. I think I just became a fan of Katzbalgers. 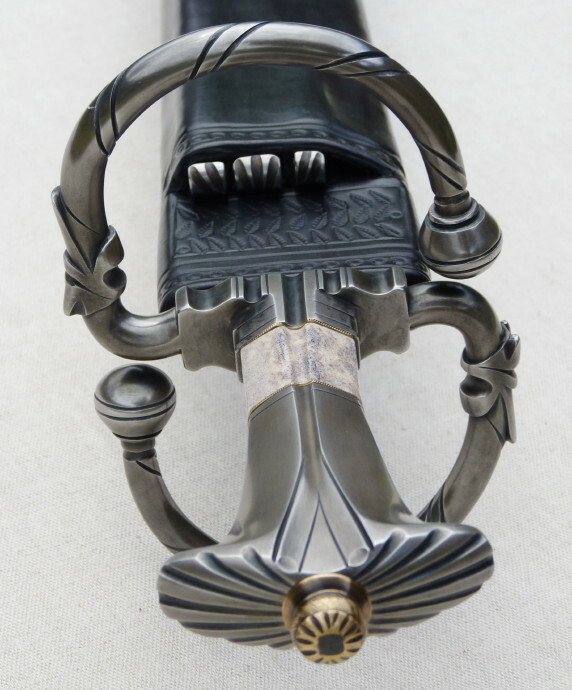 I love the details of the hilt, with the fullers of the blade continuing into the quillon block, grip and pommel. Beautiful work. What a beautiful sword! I can only suggest one thing to improve it. it would look even better in my hand. What an outstanding piece of kit, really lovely. Nathan you really need that, it screams your name.